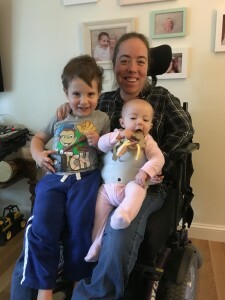 You are here: Home / Blog / Disabled Parenting / LapBaby: The Babywearing Solution for Wheelchair Users? LapBaby: The Babywearing Solution for Wheelchair Users? The Disabled Parenting Project (DPP) recently had the opportunity to review the LapBaby, a hands-free baby carrier. The LapBaby was designed to allow parents to safely hold their baby hands-free while in the sitting position. While not specifically designed for parents who are wheelchair users, the LapBaby holds great potential! Below are reviews from DPP co-founders Erin Andrews and Robyn Powell. We looking forward to hearing about co-founder Kara Ayers’ thoughts once she delivers in March. I tried the LapBaby with my daughter, 18 months. I was impressed with the design, the pouch to hold it, and the overall simplicity. It was easy to use and more intuitive than many other types of wraps or carriers. My daughter is getting a little big for these tools, but she is familiar with baby wearing so she was game. Because I have bilateral hip disarticulation, I don’t have a lap. So I could only use LapBaby when the surface I was on was deep enough so baby could sit in front of me. Overall, it worked great. My daughter enjoyed being in it, and she tried to take advantage of her position and try to drive my wheelchair. At times I felt like she was slipping down, put I could reposition her easily. 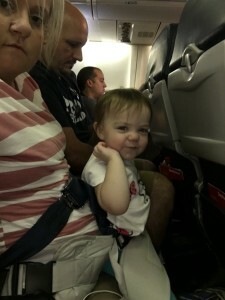 However, the very best place I found to use LapBaby was on an airplane! Like other budget conscious parents, I fly with my babies as a “lap child” until it’s no longer allowed. If there are no extra seats, I truly have to hold her on my nonexistent lap. LapBaby was invaluable – saved my arm and helped me keep baby somewhat contained. Although I am not yet a mom, I am an aunt to two great kids. When my nephew, Brayden, was born, I tried a number of different ways to hold him. As a newborn, I was able to safely hold him using a Sakura Bloom ring sling. While this worked initially, as he got bigger (and more squirmy!) I found myself struggling. I then tried an Ergo Baby. Again, this worked for a little while. However, I was not 100% confident that he was completely safe with either carrier. They simply were not designed to be used while sitting. In May 2016, my niece, Riley was born. Once again, I hoped to use the ring sling to hold her. However, I frankly could not remember how to use it so ultimately just held her for short periods of time with a nondisabled person always nearby. Again, this became more difficult as she grew. When DPP was given the chance to try out the LapBaby I was so excited! Could this be the solution I was looking for? I tried the LapBaby when Riley was 5 months old. In many ways, it was like a dream come true – this was the first time I felt 100% sure I would not drop her! 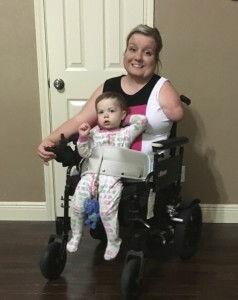 I was able to even drive my wheelchair around the house with her nice and secure (other than when she grabbed my joystick and tried to drive!). In addition to being able to safely hold Riley and move around, there are many other things I loved about the LapBaby. I found it incredibly easy to set-up and use. In fact, I would suggest not even looking at the instructions as they were confusing. Although I was unable to independently attach the carrier to me, I am not sure I would be able to with any type. I also loved that there is a strap to attach a teether or toy (Riley did too!). Finally, and not at all planned, because Riley was completely attached to me, I was actually able to hold her and Brayden (who is now 2) at the same time. This was completely unplanned – he hopped up after seeing his sister there. However, it was truly great! In sum, I believe the LapBaby has great potential for parents with disabilities! My only complaint – and something I believe is easily fixable – is I wish it included some type of bucket seat or strap that went between the baby’s legs. A few times I needed assistance because she had slid down and a strap of some kind would have prevented that. Nonetheless, I look forward to using the LapBaby when I have a baby! My husband, who is a powerchair user with limited arm mobility liked the “sit seat” from one step ahead, designed for airplane travel, for carrying our daughter. It has a step between the legs as well. What a bizarre product. Why is there no strap between the baby’s legs? Why does Robyn think she’s less likely to lose/get confused about how to use this, compared to a cheap, simple, and washable ring sling? I’m a wheelie mum and used a ring sling for the first 7 months, face to face with my son tight against my chest. Then, for facing outwards, I switched to two ring slings, one on each shoulder, crossing over in front of him and forming a double pouch under his bottom – so while he is sitting on my lap most of the time, it safely takes his weight when I stand to transfer eg between car and wheelchair. 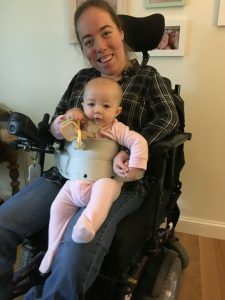 Most places have “sling libraries” where expectant parents, including those with disabilities, can discuss their needs with an expert and try out several products. This, rather than any one product, is what I would recommend to other parents. I’m so glad I found this post. I’m a soon to be grandma, who is in a power chair and have weak biceps, so holding a baby is out of the question. I too was bothered by the lack of under-the-baby strap and wrote to the company. They replied it was to conform with EU safety laws. EU believes a bottom seat strap would give the parent the belief they could walk around with the baby using Lap Baby and would therefore also require over the should straps–making it a carrier. They opted to not go that route. I will find a friend who sews to sew on a seat strap and add a snap or velcro attachment to the front, and thus prevent slippage.